Anthony Watts has made a big to-do about banning Dragon Slayers from WUWT on the grounds they deny the greenhouse effect. However many of his guest posters also deny the greenhouse effect, so I can't see why he makes such a fuss about the Dragon Slayers. Just yesterday Anthony Watts published an article by Vincent Gray denying the greenhouse effect of carbon dioxide. Not only that, as we'll see, Vincent Gray denies not only the greenhouse effect, he also denies that the sun can warm the world and he denies the laws of physics. There are two gases in the earth’s atmosphere without which living organisms could not exist. 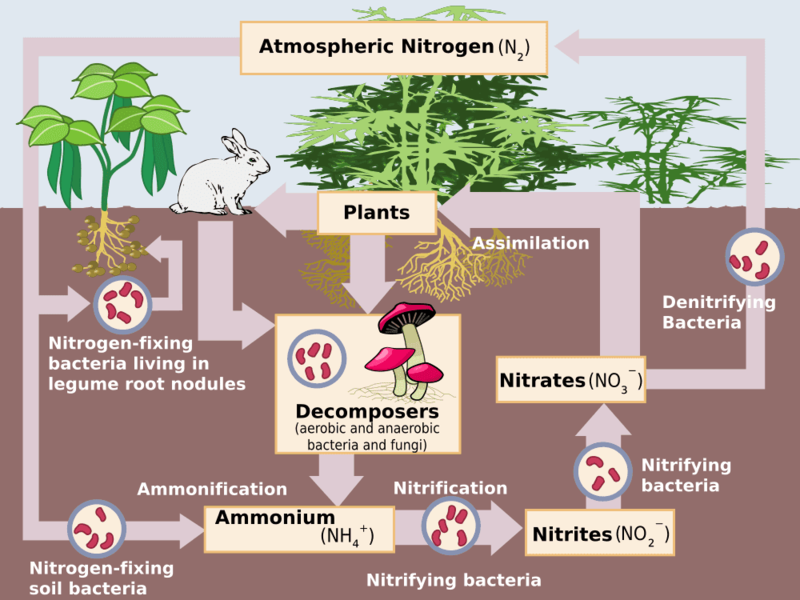 Oxygen is the most abundant, 21% by volume, but without carbon dioxide, which is currently only about 0.04 percent (400ppm) by volume, both the oxygen itself, and most living organisms on earth could not exist at all. 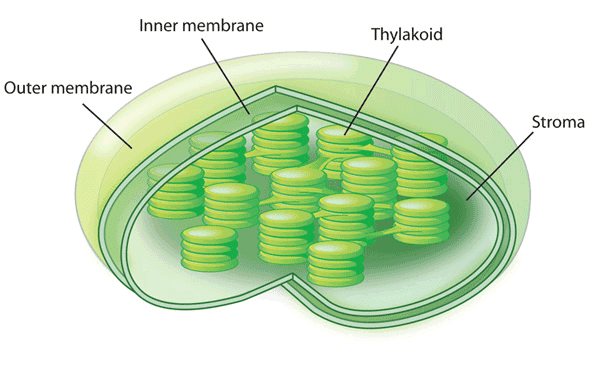 This (increase in atmospheric oxygen) happened when the more complex of the two living cells (called “eukaryote”) evolved a process called a “chloroplast” some 3 billion years ago, which utilized a chemical called chlorophyll to capture energy from the sun and convert carbon dioxide and nitrogen into a range of chemical compounds and structural polymers by photosynthesis. The evolution of oxygen-producing cyanobacteria was arguably the most significant event in the history of life after the evolution of life itself. Although Gray's knowledge of biology and paleobiology is outdated at best, that's by the way. He's sloppy when he writes about how earth's atmosphere became oxygen rich. To read more about the oxygenation of early Earth, read Canfield, and Bekker et al (2004) or look up the Great Oxygenation Event. 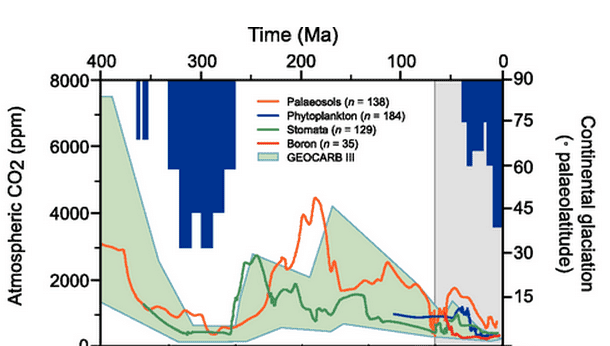 Before that occurred there was some oxygen in the atmosphere as reported by Anbar et al (2007) in Science. Moving along. Gray put up a chart that is cobbled together by some unnamed person purportedly from material by scientists like Prof. William Ruddiman. Gray employs the sort of deception practiced by others on WUWT like Don Easterbrook. Unlike Gray, Ruddiman knows very well that CO2 is a greenhouse gas and acts as a 'control knob' on Earth's climate. In fact Ruddiman argues that anthropogenic climate change began thousands of years ago. ...The CO2 feedback hypothesis can explain why the northern and southern hemispheres responded nearly in phase on terminations (Broecker and Denton, 1989). Near the ice sheets, changes in ice-sheet size set the climatic tempo. Far from the ice sheets, most climatic responses were strongly affected by an atmospheric CO2 signal that was largely controlled by (and in phase with) the northern ice sheets. As a result, most global climatic signals were ice-driven and nearly synchronous. An exception is the tropics, where summer insolation forcing produced very strong monsoon responses that were largely independent of northern ice (Kutzbach, 1981). Just, lookey here. This is a more accurate diagram than Gray's, showing the state of the science in 2007, from the IPCC report. Looks like a correlation after all. It will be seen that there is no correlation whatsoever between carbon dioxide concentration and the temperature at the earth’s surface. Wrong Mr Gray, as can be seen in the diagram above. And apart from his suspect cobbled drawings, Gray doesn't consider the sun. Funny that. One minute deniers will shout "it's the Sun" (when they aren't shouting "it's insects"). Now Gray ignores the faint sun in early times altogether. If you're wondering how early earth kept warm, when the sun was much more faint, here are a couple of papers from Science in January this year. The first from Robin Wordsworth and Raymond Pierrehumbert and the second from James Kasting. "The idea promulgated by the IPCC that the energy received from the sun is instantly “balanced” by an equal amount returned to space, implies a dead world..."
Really? First of all, the whole reason for the IPCC being established is that there is more incoming energy than outgoing and the world is getting hotter. We've kicked the system out of 'balance'. Nowhere does the IPCC say what Gray wrote. It's silly. He's just making it up. He's also forgotten all he ever knew about energy and physics. During the Holocene there was a pretty good balance between incoming and outgoing energy. That's what happens. That's why the climate didn't change all that much until recently. I wouldn't describe the Holocene as a "dead world". Would you? When there are large imbalances on the other hand, then much life can die - like in the various extinction events. The system seeks balance, otherwise earth would have got out of kilter long ago. The earth had got to a nice equilibrium state where the incoming energy was matched with outgoing energy. Now the push comes because CO2 is forcing earth to retain more of that incoming energy. Because of the extra CO2, energy is taking too long to escape and in the meantime, the sun keeps sending us more energy. Over time, earth will get to a new energy equilibrium where outgoing radiation will once more balance with incoming radiation and earth will stop heating up. It will be hotter than it is now, though. the laws of physics (that the earth will seek to balance incoming energy with outgoing energy). Is Vincent Gray merely ignorant? No, given his political lobbying efforts he's a deliberate deceiver, misrepresenting the science. It's not as if he doesn't have a science background himself. He has the brains and education to know better so the only explanation is that he's intent on spending his few remaining years on earth making it worse for people not yet born. As for Anthony Watts accepting the greenhouse effect. Yes he does but he continues to publish articles like this one from Gray that deny it. There was a figure I've seen which is similar to the standard paleo-climatological figure showing CO2 and temperature, but also includes solar forcing to show how - with that included - the correlation is very good. Have you seen such a figure? AFAIK there is still a fair bit of hypothesising on the very early earth. There are also other greenhouse gases that played a much bigger role in the past at different times than they do today, particularly CH4. I know this is an old post, but I found the source of Gray's unnamed chart. It's by a wackjob biologist AGW denier called Nasif Nahle. Notice Vincent Gray has removed Nasif's name from the bottom of the chart? I found it because a poster on a forum tried to pull the same stunt by posting Nahle's chart without a link.